WARNING: Fake Registration and Hotel Websites for ESPID 2019 Annual Meeting in Slovenia! Fraudulent websites including fake emails (from:espid@20l9conference.com) may pose as official ESPID 2019 registration and hotel providers. Bookings contracted through these fake websites and email addresses do not guarantee access to the Meeting or a confirmed hotel booking. The program awards two-year grants to applicants at any stage of their career, and all members of PIDS are encouraged to apply. The research award provides $50,000 in total costs per year for two years, assuming satisfactory research progress similar to NIH R03 awards, and includes an 8 percent allocation for indirect overhead costs for the award recipient’s institution. To apply, visit here. The deadline for submission is May 20, 2019 and announcement of successful applications will be made at the annual IDWeek meeting in the Fall. 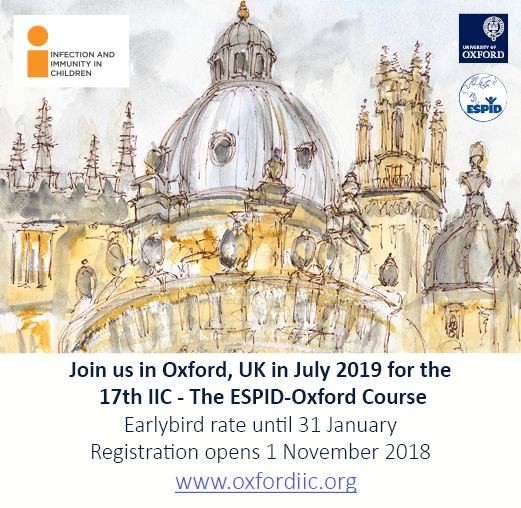 There are vacancies for both a research fellow in paediatrics to work on vaccine and infectious disease research, and a paediatrician to work with the clinical paediatric infectious disease service in Oxford Children’s Hospital. Young ESPID members are invited to participate in a survey on PID training programmes across Europe and beyond. WARNING-Fraudulent websites including fake emails (from:espid@20l9conference.com) may pose as official ESPID 2019 registration and hotel providers. Bookings contracted through these fake websites and email addresses do not guarantee access to the Meeting or a confirmed hotel booking. © 2019 ESPID. All rights reserved.